Antonio da Correggio, The Betrayal of Christ, with a soldier in pursuit of Mark the Evangelist, ca. 1522. The parallel accounts in the other canonical Gospels make no mention of this incident. The wearing of a single cloth would not have been indecent or extraordinary, and there are many ancient accounts of how easily such garments would come loose, especially with sudden movements. Simply someone else who happened to be there. Many have seen this episode as connected to a later verse in Mark: "And entering the tomb, they saw a young man sitting on the right side, dressed in a white robe,"[Mk 16:5] as the word for young man (νεανίσκος) occurs in Mark only in these two places. ↑ Bauckham, Richard (2006). Jesus and the Eyewitnesses: The Gospels as Eyewitness Testimony. pp. 197–201. ISBN 0802831621. ↑ Ambrose, Exp. Ps. 36 60. ↑ Peter Chrysologus, Sermon 78. ↑ Allen, Rupert (2008). "Mark 14,51-52 and Coptic Hagiography" (PDF). Biblica. 89 (2): 265–268. Allen studies the origins of this theory and finds it first mentioned in a 13th-century manuscript. ↑ Haren, M. J. (1998). "The naked young man: a historian's hypothesis on Mark 14,51-52". Biblica. 79 (4): 525–531. ↑ Jackson, Howard M. (1997). 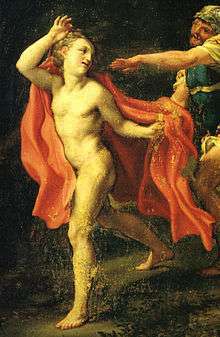 "Why the Youth Shed His Cloak and Fled Naked: The Meaning and Purpose of Mark 14:51-52". Journal of Biblical Literature. 116 (2): 273–289. doi:10.2307/3266224. JSTOR 3266224.